Fox News exerts more power over the electorate than you might think. Can Fox News Get Trump Elected? The network exerts more power over the electorate than you might think. 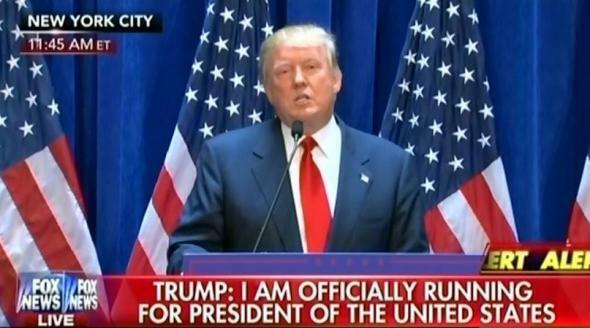 A June 2015 Fox News broadcast of Donald Trump announcing his presidential campaign. For years now, Fox News has been the most-watched cable news channel in America. While it lays claim to neutral reporting, its coverage has typically been more sympathetic toward Republican candidates in general elections. But the 2016 presidential race hasn’t exactly been typical. The Republican Party is set to nominate a figure in Donald Trump who has divided his own party and been at odds with Fox News, too, since squaring off with anchor Megyn Kelly at a debate last August. Lately, however, there have been signs of a possible détente—including a soft-focus interview with Kelly in March—suggesting that Trump may get the same enthusiastic support Fox has provided to Republican candidates in elections past. How much would the full-throated backing of Fox mean to Trump? A great deal, given the findings of a pair of studies analyzing Fox’s impact on vote share. The studies find an effect that’s sufficiently important that it’s earned a name: researchers who study the influence of mass media on politics call it the “Fox News Effect.” Far from simply preaching to a conservative choir, Fox, the researchers find, has been winning ever more hearts and minds for the Republican Party over the past 15 years. If we take the studies’ estimates of the Fox News Effect seriously, it could easily prove pivotal in deciding the 2016 presidential election. Martin and Yurukoglu use the differences in audience size that come from Fox’s random positioning in the cable lineup to calculate how much impact the channel had on voting in the 2000, 2004, and 2008 presidential elections. For 2000, they generated an estimated impact pretty close to what DellaVigna and Kaplan calculated a decade before. But they also found that Fox’s impact took off during the decade that followed: It increased Republican vote share by more than 3.5 percentage points in the 2004 election and more than 6 percentage points by 2008. These gains, the economists argue, come from an increase in Fox viewership combined with what they calculate to be an increasingly pro-Republican bias at the network, based on an analysis of Fox transcripts. These are huge numbers: Since the U.S. has a two-party system, one more vote for the Republican nominee is typically one vote less for the Democrats. So an extra 6 percent share for the Republicans means 6 percent less for the Democrats, suggesting Fox News’ support could erase a 12-percentage point Democratic lead in the popular vote. Let’s assume Martin and Yurukoglu’s estimates capture something close to Fox News’ actual influence today (the channel’s viewership has held steady since 2008). A Reuters poll in early June had Clinton leading Trump by 11 percentage points: Fox’s support could make such a race a dead heat. Support from Fox could even help Trump climb out of the hole he’s dug recently with poorly received statements on the mass shooting in Orlando and his attack on a federal judge overseeing the fraud case against Trump University. Of course, Trump has surely already benefited from the Fox News Effect—he’s enjoyed the support of Sean Hannity and Bill O’Reilly, among others, for months. But if he commands the full support of the network in the general election, Fox could play a pivotal role in deciding the victor. Of course, Fox is hardly the only media outlet with sway in this election. There’s a parallel story to be told, we’re sure, about MSNBC’s effect on its viewers. We focused on Fox because of its scale. They may face increasing competition from online options like Facebook, which faced recent accusations of giving a liberal bias to its news feed. But there is still no other US news source—news channel, newspaper, magazine, or social media—has the attention share that Fox News commands. That is, not only does Fox have a far greater viewership than its competitors—it has three-times the audience of MSNBC—its viewers are also less apt to seek news from other sources. Donald Trump has made no secret of his disdain for the media, and the press is right to be concerned about the steps a President Trump might take to curtail its powers. Those powers are essential to keep elected officials accountable to voters. But the power of news outlets like Fox to swing elections should also give the public pause. If it is true that Fox News has the potential to anoint a winner, how do we know that they will not use it to secure favors or assurances from presidential hopefuls? If media moguls are communicating with presidential hopefuls outside the spotlight, what are they asking for, and what are they promising? We, the electorate, have the right to know. Read more from Slate on the 2016 campaign.